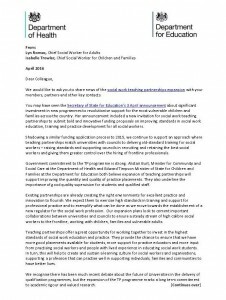 Isabelle Trowler, Chief Social Worker for Children and Families and I recently wrote out to the sector inviting applications for the opportunity for additional investment in developing teaching partnership approaches. There is growing recognition by employers of social workers that they have a responsibility to nurture the next generation in the same way we expect the NHS to support the education and training of doctors and nurses. While the funding arrangements may be different, we do need to use every opportunity to improve the arrangements that are in place to make sure student social workers have every opportunity to experience good quality placements, supported by excellent practice educators. Creating and sustaining a learning culture and environment where reflective practice, evidence and research mindedness underpin the focus on practice remains vital. Getting the balance right between procedure and process continues to be as challenging as ever. However, we are now making progress on getting this right. The other vital areas the partnership approach must support are the ongoing investment in continuing professional development of qualified staff and the promotion of opportunities for experienced social workers to update their knowledge and skills. Partnerships can also contribute to educating, coaching and mentoring qualifying and newly qualified social workers. Most importantly, the involvement of people with lived experience and their carers, both in educating students and shaping modern practice alongside qualified and experienced social workers, is essential. I have a particular interest in ways in which arrangements will support a growing evidence base for effective social work. I attended the annual NIHR School for Social Care Research annual conference in London recently. I had the privilege of speaking about the need to have a much stronger evidence base for the effectiveness of social work with adults. For me this means really understanding the difference social workers make and, very importantly, which social work methods are most effective in achieving better outcomes for people with whom we work. It was fascinating to hear about the research findings into social workers as assessors, models of adult safeguarding and equity in end of life care, and user led, co-produced research in mental health to name just a few areas. 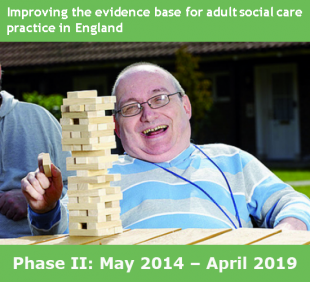 Take a look at the website and also Social Care Elf which I promoted in an earlier blog, to see the latest research findings. 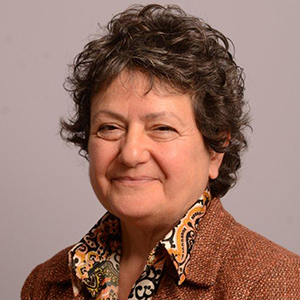 The Social Care Institute for Excellence (SCIE) and Research in Practice for Adults (RiPfA) also possess a wealth of knowledge practitioners can access. Making sure we have social workers who are interested in research and teaching in relation to working with adults and their families - and who will become the teachers and researchers for future social workers - is very important. I know that in some universities, attracting social workers into teaching posts with experience in adult work has been challenging. I hope that teaching partnerships will go some way to encouraging this pathway. I found this very interesting as I have a long held belief that we have some excellent none registered staff in Adult services (often working as Care Manager Assistants) who have the potential to become excellent Social workers if they are able to continue to work whilst undertaking the relevant training with some financial help towards the cost . Often these are dedicated people who love their work but cannot - for a number of reasons but mainly financial - give up there job to study full time. Although Local Authorities do support some people through their training the numbers are often limited due to the financial constraints of the Local Authority. I can't help feeling that there is a missed opportunity here for the individual and for the Social Work profession. Some of the people I know in this situation have a lot of experience of working in social care and are desperate to progress and learn, some already have a degree which may relevant to Social Worker. I am sure that across the UK there must be a number of part time courses but the ones that I am aware of are still too expensive for the staff concerned to completely fund. Maybe some sort of partnership arrangement could enable more people in this situation to undertake the B.A in Social Work.